As modern gender movements shift our cultural norms, the literature describing Title IX suggests possibly concerning trends in both hiring and policy. Many university administrations and recent legislation have promoted a defensive, legal-minded and objective approach to handling Title IX cases. Since the April 2011 Dear Colleague Letter, which delivered a mandated timeframe and eased the burden of evidence, the number of cases the Office for Civil Rights have grown significantly. The number of cases continues growing despite huge increases in labor hours and financial resources being diverted to Title IX enforcement. In contrast, research has demonstrated that education, such as bystander training is a proven deterrence to campus sexual assault. By prioritizing investigation and limiting compliance officers legally acceptable options, we have perhaps shifted officers time away from actions which might lead to more positive outcomes including reducing the overall campus-wide criminal incidence frequency. 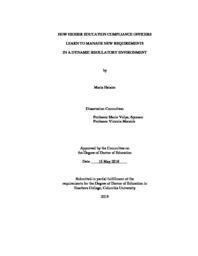 This qualitative case study was designed to explore how higher education compliance officers learn to manage new requirements in a dynamic regulatory environment. The site for the study included private and public colleges and universities in the northeastern part of the U.S. The primary sources of data were in-depth interviews with nineteen Title IX compliance officers supplemented by an extensive review of relevant documents. Key findings that emerged include: (1) A majority of compliance officers defined the need to interpret new regulations with general counsel before communicating resulting changes to stakeholders. (2) All regulators learn through informal learning means; dialogue and critical reflection were universally reported as the most frequent pathways by which regulators made meaning of new regulations. (3) Most compliance officers described sharing information with peers as most helpful to them in completing regulatory tasks. Trends in Title IX compliance hiring and labor hour allocation appear to not address the growing frequency of OCR investigations. Real changes to campus policy, including budget priorities, training and the use of student activists may allow universities to better optimize the money and personal they invest toward Title IX.